Not a fan of the traditional upright vacuum and think you want to try something other than a robot vacuum? Are you familiar with canister vacuums? This week we will be taking a look at the Miele Compact C1 canister vacuum. Does this canister vacuum have what it takes to compete robots or uprights? There’s only one way to find out! Continue reading below to discover if the Miele Compact C1 is the best canister vacuum for you. The Miele Compact C1 has a 29.5 foot cleaning radius. This canister vacuum has several floor surface options for more specific cleaning styles. This Miele canister vacuum bag can be difficult to empty at times. Images on the cleaning control mode knob are difficult to understand. The Miele Compact C1 canister vacuum embodies an egg shape with a vast majority of the unit utilizing a gray color scheme with hints of black and white. The glossy look helped to create a sleek appeal overall. A small handle is built into the top of the Miele C1. Just below the handle is the hose connection point. This is where users can insert the suction hose into the canister to ensure dirt and debris is placed into the bag after being sucked up. As you continue to move down the vacuum, there is a knob that rotates between eight different cleaning options. Lastly, the power and cord retraction buttons are located next to the cleaning cycle knob, and are big enough to be pressed with a foot. The cord is stored inside of the Miele Compact C1 vacuum. As the cord is pulled it will unwind from the inside of the vacuum but it can also be put right back into the vacuum with the push of a button. This is a nice addition as users don’t have to look at the cord since it is stored away while not in use. As a canister vacuum, the Miele Compact C1 has a multitude of cleaning options. That said, each one of these options uses the same vortex motor and filtration system to ensure the dirt, debris, and dust is sucked up and stored properly until thrown away. Some of the images shown on the vacuum can be difficult to understand. That said, the image of the curtains is one of the more clear options. Once you spot this image on the power knob, you can work in a clockwise direction to pair the image with the style of cleaning listed above. The Miele Compact C1 uses a bagging system instead of a dust bin. Debris is sucked up and filtered into the bag as shown in this image. With the egg shape of this Miele vacuum comes a slightly heavier weight. In total, the unit weighs 16.1 pounds. Additionally, the Miele C1 is 18.2″ long, 8.7″ tall, and 11″ wide. Although this is not a small unit, it does not feel like a large one by any means. The low-profile design keeps it from feeling bulky or unnecessarily large. 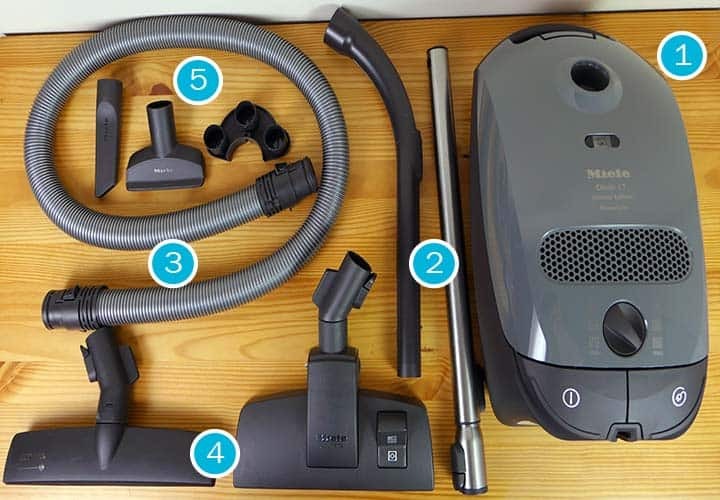 The following vacuum cleaner tests are designed to show how the Miele Compact C1 canister vacuum performs on different surfaces, picking up a variety of debris types. UPRIGHTS – Think you’d prefer an upright vacuum? See our reviews for Shark, Dyson, and Bissell. The hardwood floor tests were no match for the Miele Compact C1 vacuum as each debris type was cleaned up at a level of 100%. The vacuum did not struggle with any of the debris on the hardwood floor and was able to capture each one with a single pass over each specific section. Once again, this Miele canister vacuum was able to eliminate the debris fields without any issues. After changing the floor type setting to low-pile carpet, I was able to clean up each debris type with the Compact C1 vacuum quite easily. There were no pieces of debris remaining after the four low-pile carpet tests. Last but not least, the high carpet tests. Both rice and cereal did not stand a chance against the Miele Compact C1, as each was cleaned up to a level of 100%. Sugar and kitty little showed the slightest of slight struggles, cleaning up 99%. Nevertheless, this is still the best cleaning performance we have tested in any vacuum to date. Choose the cleaning tool you’d like to use – With a few different options available, users have to select which tool is the most appropriate for the cleaning session they are about to complete. Simply snap the preferred tool into the hose / wand and you should be good to move on. Plug the Miele C1 vacuum in – While the cord is stored inside of the vacuum, you are able to grab the main plug and pull the cord out so it can be plugged into the wall. Unroll as much of the cord as necessary. Select the appropriate cleaning style and turn the vacuum on – There are six different cleaning modes available, which means users need to be sure they have turned the cleaning mode knob to the correct position. Small images are the labels for each surface type and they can all be described in the user manual as well. After selecting the cleaning mode, press the power button and begin cleaning. PORTABILITY – If you need easier portable, see our handheld vacuum reviews. These three steps are all quite easy to knock out, making using the Miele Compact C1 a simple task. The setup was also painless. The main unit came assembled, but you do have to attach the hose and cleaning tool. Maneuverability is what you make of it with regard to the Miele Compact C1 canister vacuum. 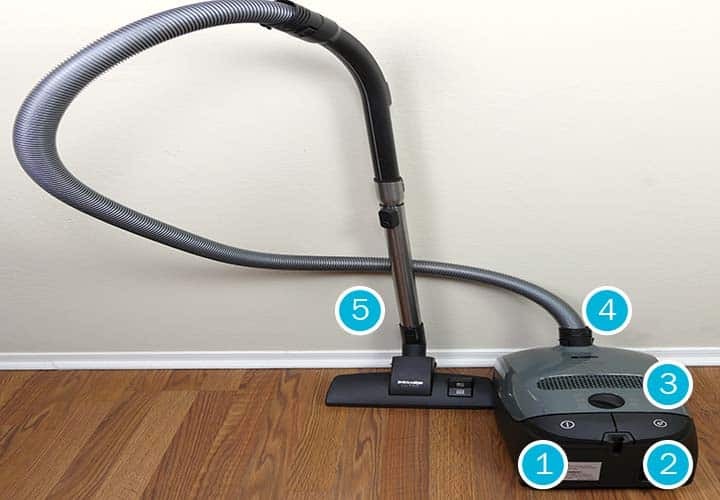 A combination of features make this vacuum extremely easy to move around and clean your home. These features include wheels on the canister itself, a long hose / wand, and a long cord. A total reach of 29.5 feet is impressive. The hose and cord combination allows users to roll the vacuum with them as they clean, then stretch the hose while unrolling the cord completely. The cord is 18 feet long and the hose is another 5 feet long. After connecting these two together, you can add a brush head to the hose which will add more length the the unit as a whole. When looking at the overall picture of this vacuum, you can maneuver it with little effort. The wheels on the bottom of the Miele Compact C1 roll smoothly, requiring hardly any extra force from you during a cleaning session. The hose / wand move fluidly as well, creating a easy maneuverable vacuum cleaner. The following table indicates the frequency at which you will likely want to replace the various parts and components of the vacuum. The following replacement frequencies are what the manufacturer recommends. However, your individual experiences may vary. Maintaining the Miele C1 vacuum requires a bit more from the user. There are four main parts that need to be replaced; the filter bag, exhaust filter, pre-motor filter, and dust compartment HEPA filter. None of these are difficult to replace, per say, but they are important pieces of the puzzle. If you replace the bag four times a year, both the pre-motor and exhaust filter once a year, and the HEPA filter twice a year, you can expect to pay around $36 annually. In addition, users should be sure to clean the heads of the brushes included with the Miele Compact C1 after a few uses. Maintaining these pieces will help ensure the vacuum cleaner is working to its optimal performance level. At 3′ away, the Miele Compact C1 vacuum emits 81 dB of sound. Based on the cleaning performance, a reasonable price, a variety of included parts and accessories, and a sturdy design, this Miele canister vacuum offers an incredible value. The Miele Compact C1 flew through our cleaning tests with ease. There was not a point where this vacuum cleaner struggled with any debris field on any of our three surface types. CONVENIENCE – If the canister sounds like too much work, check out our robot vacuum reviews. The Roomba 980 or Ecovacs Deebot N79 are great choices. If you’re a fan of the canister design, the Miele Compact C1 is one you should consider. The warranty is also a bit different than most vacuums we have tested to date. Miele offers a seven year warranty on parts and labor for this model, and a one year warranty on the motor and casing. Although it would be nice to see the warranty extend a little longer on the motor, the seven year parts and labor warranty certainly adds value. Who Should Buy the Miele Compact C1 Canister Vacuum? The Miele Compact C1 canister vacuum is one powerful vacuum cleaner. With six different cleaning modes available, the suction of this unit can be changed to suit your specific needs for each cleaning session. Designed with a 29.5 foot cleaning radius, users have the ability to cover a lot of ground when plugged in. The Miele C1 offers an exceptional performance and an incredible value. Want a canister vacuum – Canister vacuums are virtually a handheld vacuum with the power of an upright vacuum. Users have the ability to place the head of the unit directly on top of a debris field and clean it up immediately. That said, canister vacuums do typically have bags instead of a dust bin, which can be a little more daunting to empty / change. Want a longer reach with from their vacuum – This vacuum has a cleaning radius of 29.5 feet. The cord, hose, and wand give this vacuum a longer reach than most corded upright or corded stick vacuums. Like the idea of multiple floor type cleaning modes – With six different cleaning modes available, users can narrow down exactly what style of cleaning they are looking to complete. Whether it is cleaning some curtains or digging deep into high pile carpet, the Miele Compact C1 has a mode for both. For more information on the Miele Compact C1 visit Amazon.com. August 6, 2018 – Updated the review score as part of our site-wide 1.0 scoring overhaul. Score increased from 96% to 99%. The Miele Compact C1 is a canister vacuum built with a purpose. Six different surface cleaning modes, multiple cleaning tools, and top notch performance all combine to create a well rounded unit. Users who are interested in a powerful unit with above average maneuverability may find the Miele C1 to be a fine choice for their home. If you’re in the market for a new vacuum cleaner and can’t decide what style would suit you best, this Miele canister vacuum is worth giving a shot.